Posted under Health Guides. Updated 30 March 2018. Sugar substitutes are used to sweeten food and drinks without adding sugar. Sugar alcohols, stevia sweeteners, monk fruit extract, and artificial sweeteners are all sugar substitutes. Most sugar substitutes are considered safe if they are used in moderation. Sugar substitutes (sometimes called low-calorie or artificial sweeteners) are ingredients used to sweeten foods and beverages instead of sucrose (sugar). You’ll find a variety of foods on the market that contain sugar substitutes; some food companies advertise this but you may need to look closely at the ingredient list to find out if a food is sweetened by a sugar substitute. Some products that contain sugar substitutes are diet soda and sugar-free syrup, gum, low-calorie ice cream, fruit cups, yogurt, pudding, and more. If a food tastes sweet but it is very low in calories, chances are that it contains sugar substitutes. There are different kinds of sugar substitutes including artificial sweeteners, stevia, and sugar alcohols. There are some benefits and some possible downsides to using sugar substitutes. Artificial sweeteners are chemicals that are generally much sweeter than sugar, so a smaller amount is needed to have the same sweetness as sugar. They typically provide very little to no calories and have no nutrients in them. Products containing aspartame have a warning label because they are NOT safe for use by people that have the hereditary disease Phenylketonuria (PKU). Pregnant women may be advised by their health care provider to avoid saccharin due to the unknown long-term effects. Stevia is the common name for sweeteners such as PureVia® and Truvia® that are found naturally in the stevia rebaudiana plant. Unlike other sugar substitutes, stevia originates from a plant rather than being a manmade chemical. However, chemicals are used in the processing of stevia. Stevia sweeteners provide zero calories and are one of the most recently approved sugar substitutes by the FDA. Stevia sweeteners can be found in packets and in a variety of drinks and foods. If you are trying to avoid sugar substitutes, it is important to note that stevia sweetened products may say “naturally sweetened” so it’s always a good idea to check out the ingredient list, too! Monk fruit extract, or norbu, is the main ingredient in the sweeteners of Monk Fruit in the Raw® and Nectresse®. Monk fruit extract is made from the monk fruit, a fruit regional to Southeast Asia. The juices of this fruit are extremely sweet, so can be used in very small quantities to sweeten foods and beverages without adding calories. Monk fruit extract is made by taking the juices from the monk fruit plant by squeezing the liquid from the seeds and the pulp of the fruit. Just like stevia, products that say “naturally sweetened” may have monk fruit extract in them. Sugar alcohols are carbohydrates found in plant products. In order to use sugar alcohols as a sweetener, they are altered in a laboratory environment to make them usable in sugar-free and reduced-sugar foods. They are usually 25-100% as sweet as sugar and they provide 1.5 – 3 calories/gram when compared to sugar (which provides 4 calories/gram). Sugar alcohols can cause gas and loose stools since they are not completely digested by the body. Therefore, foods that contain sugar alcohols sometimes include the label “excess consumption may have a laxative effect.” It is also important to note that sugar alcohols, despite their low calorie count, are still carbohydrates so can still have an impact on blood sugar levels. Sugar alcohols are used in anything from sugar-free candy and gum to low-calorie baked goods and ice cream. 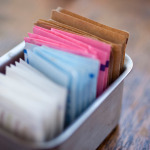 Six sugar substitutes have been “generally recognized as safe” by the U.S. Food and Drug Administration (FDA): saccharin, aspartame, acesulfame potassium, sucralose, neotame, and advantame. The FDA has also set an “acceptable daily intake” (ADI) for each sweetener which is an amount they feel is safe to have each day. It is measured in milligrams per pound of body weight per day. These amounts, listed in the table below, are based on a 132 pound person and are higher than the amount most people should have in a day. Sugar substitutes have not been shown to increase the risk of other diseases. Even though they might not necessarily be bad for you, the most nutrient dense foods and drinks (such as fruits, vegetables, milk and water) don’t contain sugar substitutes. Are there any other sugar-free ways to make my food taste sweet (without adding sugar substitutes)? There are other ways to make your foods more flavorful without adding sugar substitutes. Try adding spices such as nutmeg and cinnamon to yogurt, cooked cereals, cookies, or coffee. You can also experiment with flavors such as vanilla and cocoa powder in pudding and baked goods. The majority of foods that you eat should come from nutrient-dense foods and drinks like fruits, vegetables, whole grains, lean protein, dairy, and water. Eating a balance of food groups, similar to MyPlate, will help your body get the nutrition it needs without having too much sugar or too much sugar substitutes. Sugar substitutes can be used as a safe alternative to sugar. It’s important that we use them in moderation and eat mostly foods without added sugar or sugar substitutes. Which is better – coffee or diet soda?